Figure A68. North Pacific anomaly, interpreted as the North Pacific slab, with (horizontal) [vertical] cross sections through (A)[D] the UUP07 p-wave) and (B)[D] the combined SL2013 and S40RTS s-wave models at 1110 km; C) the location of the modern geological record that we interpret to have formed during the subduction of the slab. Recent plate-kinematic reconstructions of the NW Pacific by Domeier et al. (2017) and Vaes et al. (2019) confirm that the North Pacific slab is related to northward-dipping intra-oceanic subduction of the Kula plate below the Kronotsky arc. 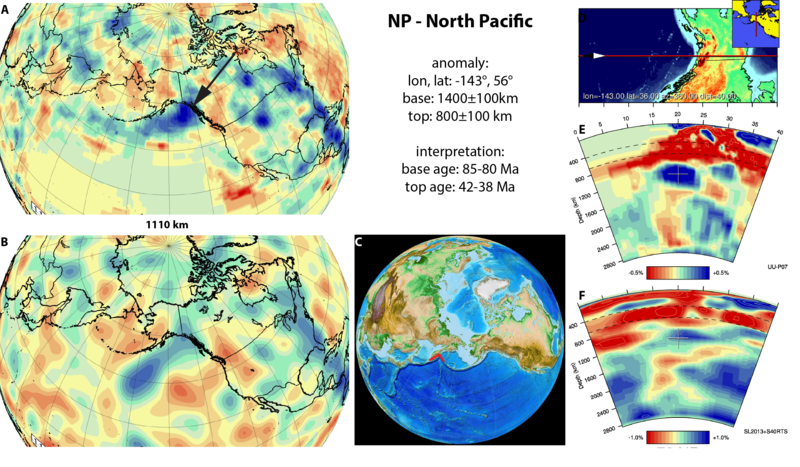 They infer, however, that the Kronotsky arc was located on a separate oceanic plate referred to as the ‘Kronos plate’ (Domeier et al., 2017) or the ‘Kronotsky plate’ (Vaes et al., 2019), instead of on a southward extension of the North American plate. The Kronotsky arc was suggested to have formed during a regional plate reorganization around 85-80 Ma (Vaes et al., 2019), which we adopt as the (updated) age of the base of the slab. The arrest of arc volcanism at 40±2 Ma (Levashova et al., 2000) may be explained by the arrival of the Kula-Pacific ridge in the Kronotsky subduction zone (Vaes et al., 2019). After cessation of subduction at ~40 Ma, the western part of the extinct Kronotsky arc moved with the Pacific plate until it collided with Kamchatka at ~10-5 Ma (Domeier et al., 2007; Vaes et al., 2019). Remnants of the (western part) of the Kronotsky arc are preserved on the eastern peninsulas of Kamchatka and possibly as the pre-Eocene basement of the Komandorsky Islands, the westernmost islands of the Aleutian arc. Based on the observed extend of the North Pacific anomaly, the Kronotsky subduction zone and arc may have continued for thousands of kilometers in northeast direction toward the North American continent (Domeier et al., 2017; Vaes et al., 2019). This suggests that remnants of the arc (if not entirely lost to subduction) may also be preserved further to the east, in Alaska (Domeier et al., 2017). The North Pacific anomaly (Figure A68) is located below the northern Pacific Ocean and southern Alaska from the mid-mantle up to upper part of the lower mantle. In previous tomographic studies it has been interpreted as Kula (Qi et al., 2007), Pacific slab (Ren et al., 2007) and was also identified as ‘K’ in Sigloch (2011). The Aleutian slab (section 3.3) higher in the mantle to the north that subducted since 56-46 Ma led us to infer that the North Pacific anomaly represents Early or pre-Cenozoic subducted lithosphere (van der Meer et al., 2010). Shapiro and Solov’ev (2009) inferred northward subduction of Kula oceanic lithosphere below a southward extension of the North American plate, resulting in the intra-oceanic Kronotsky-Commander arc now found in Kamchatka. This arc was dated by Levashova et al. (2000) to be active from 73+/-7 Ma (Campanian-Maastrichtian) to 40 +/-2 Ma (Eocene), perhaps with a switch in subduction polarity in the Paleocene, resulting in subduction of North American plate. The reconstruction of Shapiro and Solov’ev (2009), who restored the Kronotksy-Commander arc as part of the Pacific plate after its Eocene cessation, would place the arc in a positon that is in agreement with the location of the North Pacific slab. We therefore follow their interpretation and surpass our previous interpretation (van der Meer et al., 2010) which was based on an older reconstruction (Engebretson et al., 1985) of the paleo-Pacific Ocean. Following its extinction the Kronotsky-Commander arc was transported westward as an aseismic ridge to the Eurasian plate and collided with Kamchatka at ~5 Ma (Shapiro and Solov’ev, 2009).